No McKenzie Johnston? 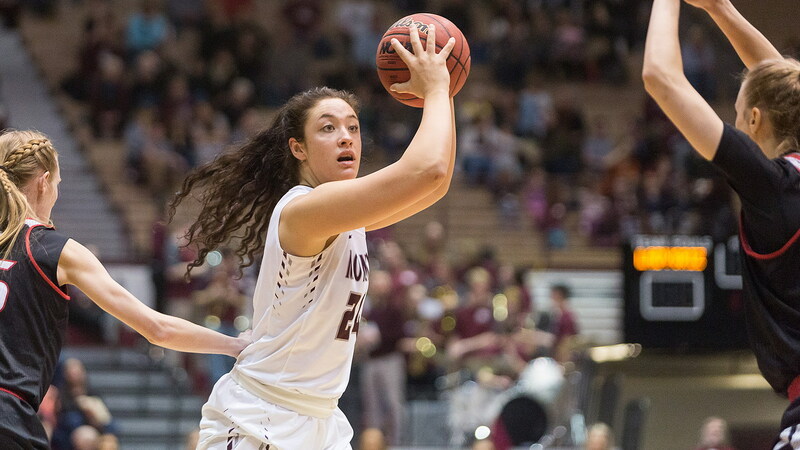 No problem for the Lady Griz, who used their size advantage and depth to open 2-0 in Big Sky Conference play with a 79-57 victory over Southern Utah on Monday afternoon at Dahlberg Arena. Johnston scored a team-high 18 points in Saturday’s 78-62 win over Northern Arizona but was out of town on Monday to attend her sister’s wedding. It’s a testament to the team third-year coach Shannon Schweyen has built that a first-time spectator would hardly have known Montana (7-4, 2-0 BSC) was without its leading scorer against the Thunderbirds. That’s because Johnston’s teammates had her back. And then some. Emma Stockholm, who seems to be improving by the game, scored a career-high 20 points, while Jace Henderson and Gabi Harrington both posted 15-point, 11-rebound double-doubles, the eighth of her career for Henderson, who was almost perfect, with just one missed shot, the first for Harrington. Like Northern Arizona did on Saturday, the Thunderbirds (3-8, 0-2 BSC) hurt Montana from the 3-point arc in the first quarter, knocking down five triples to build a 23-19 lead at the first break. But the Lady Griz scored the opening 16 points of the second quarter, then overwhelmed the Thunderbirds, who also were playing without their point guard, in the second half. Five players scored for Montana during its 16-0 run to open the second quarter and nine scored for the game, as nine Lady Griz played 14 minutes or more, no one more than Taylor Goligoski’s 30. “Being able to have depth and have multiple players playing and people not being tired is going to be a luxury for us,” said Schweyen, who also knows that such an egalitarian approach could lead to issues, as it often does in athletics. But for now, everyone is on board. Winning just makes everything better. Montana had six turnovers in the first quarter, the main reason the Lady Griz trailed despite shooting 52.9 percent through the opening 10 minutes. Maybe it was Montana settling into playing without Johnston, who was on the court all 40 minutes on Saturday and has her hands on the ball most offensive possessions in a game. Whatever it was, it didn’t last. The Lady Griz had 13 for the game as Katie Mayhue got the start in place of Johnston, with Sammy Fatkin playing 18 minutes off the bench. Both had a team-high four assists. “As worried as I was about not having Kenzie, I know how good of basketball players Sammy and Katie both are, so I had confidence,” said Schweyen, whose team had the benefit on Monday of facing an opponent that is used to playing at a slower pace. Both teams were without their point guard on Monday, after Rebecca Cardenas, who was such a menace in the teams’ game at Dahlberg Arena last season, had to sit out after suffering a concussion in SUU’s five-point loss at Montana State on Saturday. Without Cardenas, who had 22 points, eight rebounds, five steals and four assists last December, a 10-point Lady Griz win, Southern Utah shot just 33.8 percent. “They’re obviously not the same without her running their club,” said Schweyen. But it may not have mattered, not with Stockholm leading the way and becoming the first Lady Griz player this season to reach the 20-point mark. It was actually a play when she didn’t score, during Montana’s 16-0 run, that showed her evolution. She had knocked down a 3-pointer on her team’s previous possession and had another open look on the next, but she passed it off and the ball made its way inside to Kylie Frohlich, who scored. The previous two years that shot was probably going up. As a junior: 8 for 12 with 20 points scored in just 19 minutes. And it’s not just Stockholm. Henderson scored her 15 points on 7-of-8 shooting. Harrington shot 50 percent for her 15 points and took just three 3-pointers, which used to be her go-to shot. Now she can finish at the basket or with a mid-range jumper. Or still sting a team with a three. Montana shot 50 percent for the game, the third time that’s happened this season, and is now at 44.2 percent for the year. “We’re working hard on keeping that field goal percentage up. We want that to be a point of emphasis, of taking good shots,” said Schweyen. It was inside where Montana did most of its damage, outscoring Southern Utah 44-22. Six of those points came from Frohlich, who played just eight minutes but scored on all three of her shots. “I was happy to see that, because she’s one of the hardest-working kids,” said Schweyen. “You can’t ask for a kid who works harder than her. She never complains and is bought into what we’re doing. As has Harrington, who matched her career high with 15 points and set a new standard with 11 rebounds. After redshirting last season as a second-year player, Harrington is averaging 8.3 points on 42.7 percent shooting and 5.5 boards. Part of Montana’s defensive presence came by blocked shot, of which the Lady Griz had a season-high eight. Henderson and Stockholm both had one, as did Mayhue. The other five went to Abby Anderson, who gives Montana its first true shot-blocker since Carly Selvig, or the type of player who can be left alone in the paint, even when her player has the ball. If she’s not blocking it, she’s probably altering it. Montana will put its burgeoning confidence to the test next week on the road, at Sacramento State and Portland State, where the Lady Griz lost by a combined 32 points last season. Montana will face the Hornets (4-5, 0-1 BSC) on Thursday, the Vikings (8-1, 0-0 BSC) on Saturday. Portland State plays at Northern Colorado on Monday evening to open league.